Reliable data is needed to address crucial questions about environmental change, biodiversity loss and its implications for ecosystems and human well-being. The historical legacy of biological recording in the United Kingdom is unique and inspiring, resulting in vast sets of species observations (biological records) built up through the expertise of committed volunteers. But there is a need for a focused approach to the collation, management, dissemination and interpretation of these datasets. The Biological Records Centre (BRC), established in 1964, provides a national focus in the UK for terrestrial and freshwater species recording. BRC works closely with the voluntary recording community, principally through support of national recording schemes and societies. Its scientific research role is central to much of UK conservation practice. BRC is supported by the Joint Nature Conservation Committee and the Centre for Ecology & Hydrology (CEH) within the Natural Environment Research Council and its work is a major component of the National Biodiversity Network. Working with more than 80 recording schemes and societies, BRC supports biological recording for a wide range of plant and animal groups. BRC helps the recording community to publish atlases, data and other online resources thus providing information essential for research, policy and conservation. It delivers innovative use of technology to harness the enthusiasm and knowledge of naturalists and to enable them to collate and analyse records. Scientists at BRC identify and analyse distribution trends derived from these large-scale, long-term datasets. Recent BRC research includes climate change ecology, the impacts of air pollution, invasion biology, insect-plant interactions, red listing and indicators, and leads to improvements in the use of citizen science and new technology for recording. Long-term support from BRC has helped establish more than 80 recording schemes and societies - no other region across the globe has such a wide taxonomic breadth of recording activity. 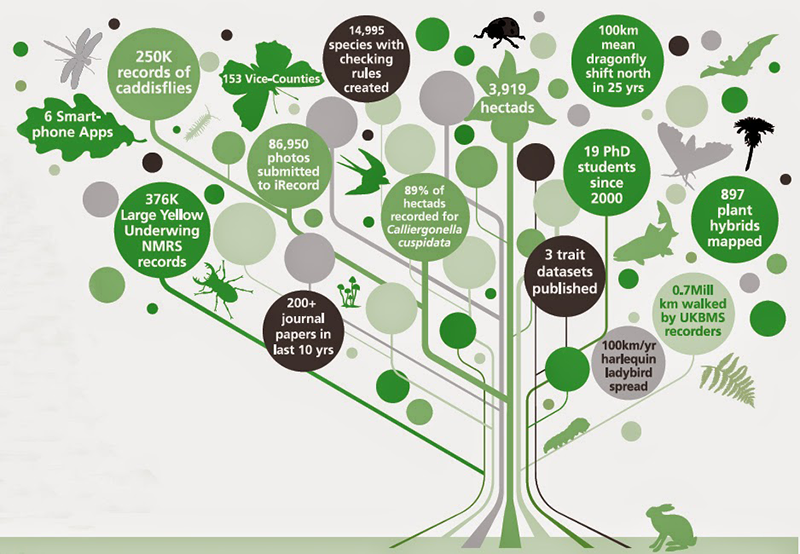 The key outputs of this recording is detailed in the BRC's special anniversary booklet, Celebrating 50 years of the Biological Records Centre (2014). Printed atlases published by BRC cover more than 10,000 species of plants and atlases. These atlases and their associated datasets have revealed major changes in species' ranges over the past 50 years and are being used to address a number of research questions. Analyses of distribution data provided some of the first demonstrations of the impacts of climate change on biodiversity. Current projects using biological recording data include assessing the risks and opportunities faced by individual species during climatic changes and identifying refugia which may help promote the persistence of species. BRC works with recording schemes, government agencies and partner organisations to derive quantitative trend estimates and other metrics for use in Red Listing and the development of biodiversity indicators to assess the 2020 ‘Aichi targets’. In 2013, BRC’s innovative work on trends, modelling and indicator development made a substantial contribution to the State of Nature Report (trends for ~2400 species) and the Priority Species Indicator which tracks changes in the status of ~230 species of conservation concern.